There are 793 million people who are illiterate As someone who has been given the gift of literacy, this concerns me. Today we honor a man who fought against social injustices. We honor a man who saw the opportunity to fight for equality and fought with bravery. It is in his honor, that I ask you to think about what you can do to end illiteracy. Imagine a world where everyone can read. Imagine that you had an opportunity to do something to help reach the goal of global literacy. On March 7, 2012, Litworld , a global literacy organization based in New York City, will be celebrating World Read Aloud Day. The purpose of the day is to celebrate the right to read and write. World Read Aloud Day motivates children, teens, and adults worldwide to celebrate the power of words, especially those words that are shared from one person to another, and creates a community of readers advocating for every child’s right to a safe education and access to books and technology. By raising our voices together on this day we show the world’s children that we support their future: that they have the right to read, to write, and to share their words to change the world. If you are local to the St. Louis, MO area, you can show your support for World Read Aloud day by attending an event that I am planning at The Teacher's Lounge Bookstore (4121 Elm Park Dr, St. Louis 63128). Come for a free story time and activity. They'll be holding a special story time from10:30 to 11:00 am on Wednesday, March 7th. Be included in the march on illiteracy! 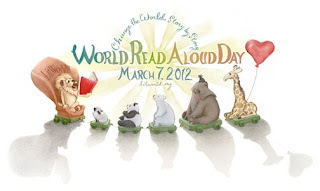 I am working as a volunteer with LitWorld as a local WRADvocate (World Read Aloud Day Advocate). I will have more details coming soon on how you can participate in the local St. Louis event. Very nice! This organization is doing amazing things. LitClubs are of interest to me, but I'm too busy to start one myself. I'm hoping to interest a few people in my community through my own LitWorld events to start a LitClub. I set up an event at our local library on March 3rd. I was so nervous to ask. Everyone was super nice. I'm excited for it to come. My three kids are going to be reading aloud at the event with me. Best wishes on your event. I'm so glad we are both doing this. I read about it last year. It's fun to be involved this year! I'm cheering both you and Michelle on from the sidelines. Literacy is such a hugely important lifeskill - it's great to see it prompted this way! What a great event! I'll have to see what is happening in our area. I don't know what school or grade level I'll be student teaching at in March (my current placement ends on February 20) but if I get the opportunity I will definitely celebrate this day!